Let your embroidery machine work for you!! Christmas will be here very quickly and you just might not have time to do this project by hand. Not to worry as you can now do this on your embroidery machine. Bird Brain, which is a company that has produced darling hand stitchery patterns for years, is now having their patterns digitized for the embroidery machine. They are multi format so they will work with most machines. Look for these Bird Brain Machine Embroidery Design CDs on our website. You can visit our website www.creations-online.com and go to the Machine Embroidery area and see lots of other machine embroidery designs from other designers as well. When you purchase a CD, we will give you our suggestion sheet to help you have a successful experience. 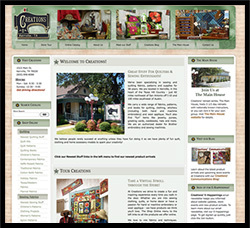 Visit the Creations website at www.creations-online.com to learn more about Creations. 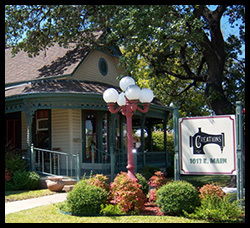 We are located in Kerrville, Texas, in the heart of the Texas Hill Country. We specialize in "Great Stuff for Quilters & Sewing Enthusiasts". We are also an authorized Brother dealer. 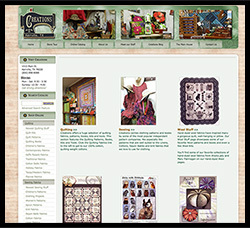 Shop our online store, also at www.creations-online.com for fabrics, patterns, books, and supplies for sewing, quilting, wearable art, hand embroidery, machine embroidery, wool projects, and home decor. You'll even find our wide selection of greeting cards from Shannon Martin and Peg Conley. The Main House at Creations is our on-site retreat center where you can attend sewing and quilting retreats with internationally renowned instructors or arrange for a retreat with your own private group. 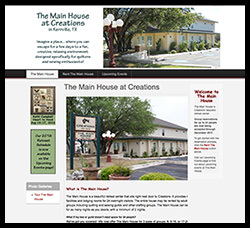 Visit The Main House website for details on this beautiful facility which sits right next door to Creations.